What the Holy Hell is Zack Wearing in Dead or Alive 5? I always figured Zack's ridiculous clothing in Dead or Alive was due to the influence of series creator Tomonobu Itagaki. Turns out he might have been the only thing holding the rest of the team back. 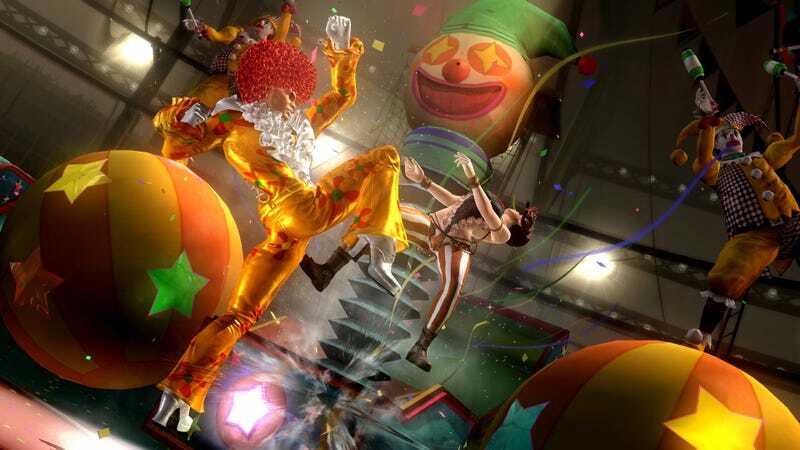 In Dead or Alive 5, Zack is a clown with a flower afro. Lei Fang's in here too, but no one cares about Lei Fang. In a battle taking place on the new circus-themed stage, "The Show", Lei Fand and Dr. Clownilicious do battle under the big top. Lions roar, afros drop, and then Zack gets shot out of a cannon. I suppose that's a stage-specific environmental attack, but it strikes me as something Zack would do anyway, fighting or not. He's one of the coolest black video game people I know. It's shaping up to be the most Dead or Alive-ish DOA game ever.